One week ago at this point I guess I was in the PACU (Post-Anesthesia Care Unit) I ended up there all night because there was not a bed available in Trama ICU where the surgeon wanted me. By staying in the PACU I was the only patient and had a nurse dedicated to me for the night. Linda was her name and she was wonderful! SO today I had my first visit with the home health care visiting nurse. She is actually set to visit with me daily until the drains are removed. The visit went well..blood pressure has been perfect! 110/70. I also received a call from the hospital to check on me. After sitting with the nurse at my kitchen table, I think it is starting to hit me the scale of my surgery. It was big! I am getting a little better at getting in and out of bed. Wish I could raise the head of my bead at home like I could in the hospital. 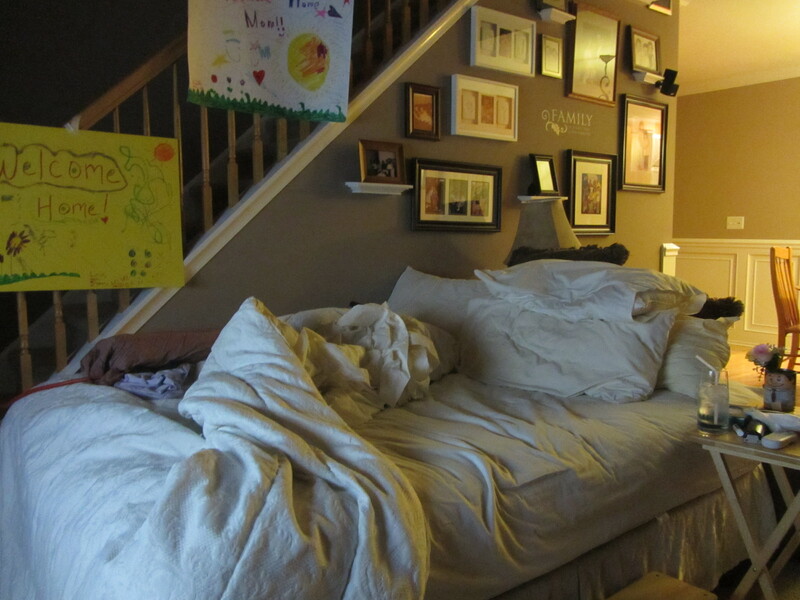 Here is the pic of my family/bed room. Thank you to my wonderful hubby for setting me up in the family room! Frank had to run out for a few work appointments today but a wonderful friend stopped in to make us lunch. How strange it is for me to sit in my own kitchen while someone else makes hot dogs for my kids. I am struggling! I want to run the vacuum, I want to lift the milk! Instead I watched my super 7-year-old put a load of wash in the washer and a neighbor swiffer my kitchen floor. Each day gets better and it has only been a week..one really long unbelievable week. Previous post3am do you know where your BPM patient is? So glad to hear your home. Hospitals are no fun, it seems like they are checking on you every hour all night long and you hear everyone else near you and their alarms are going off all night. I know the bed was very hard for my cousins wife who had this surgery. She slept in a reclining chair that would also lift up so you could get out of the chair easier. I know this because my dad used the chair when he had his bypass surgery. Please let me know if there is anything that I can do for you. I know you are a go-go-go person, but just take it easy and your recovery may be that way too. It takes time to heal. No need to rush it! I am taking it slow just not happy about it! Frank had the first parents meeting for travel soccer last night..I may need to go back to work to pay for it..ridiculous! Thank you for keep an eye on us, everyday gets better! I know what you mean. We already had our parent meeting for Mackenzie’s travel soccer in June and got a list of what we needed to purchase. It was a little crazy. I thought travel soccer started in August, her practices are starting this week. Nice, especially since she is playing a summer basketball league that the games are the same nights as soccer. Tell Frank he did a great job with your new digs. I know how hard it is to not be able to do what you want and to take care of everyone like you are used to doing. It’s not what us moms do best, take care of ourselves. You can count on us if you need any help, just let me know.